Networking goes by many different names. Some call it connecting, chatting, sharing, learning, or meeting. 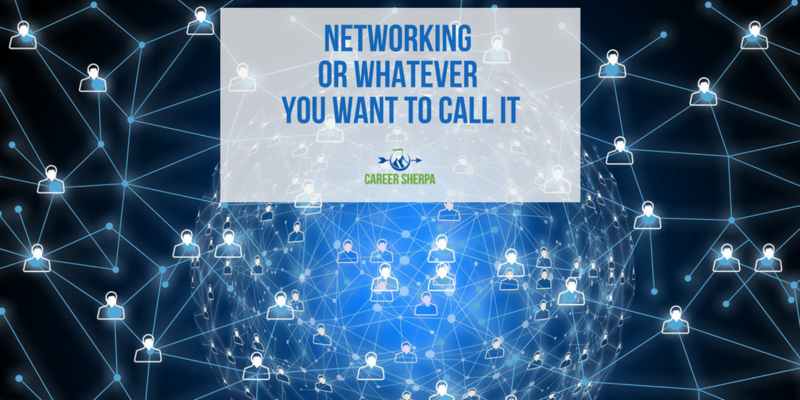 Whatever you call it, networking is simply about building relationships and sharing information. Period. Every time you talk with someone, there is an element of networking involved. Sometimes you see and feel the connection, other times you may feel like there wasn’t any connection at all. One reason job seekers get frustrated (and give up) is that it is difficult to see where these conversations and new relationships will lead. The end result of your conversations isn’t always evident. You can’t predict who will be able to introduce you to new people or opportunities. So, for people who are looking for tangible results, applying to jobs online checks the box and networking doesn’t. These meetings aren’t just about landing a job lead. You also talk with people for a variety of personal and professional reasons as well. I think networking needs a new name! Networking requires you step outside of your comfort zone, and sometimes you just have to do it! Here is some advice to make it less awkward. Learn about the other person! Have a plan and start today!